You’ll want to bring a rain jacket just in case, but the weather on Norway’s west coast is often surprisingly beautiful, and occasionally dramatic. Most visitors to Bergen choose to visit in the summer, between May and September. If you visit in May, you have to experience the beautiful cherry trees around Lille Lungegårdsvann. In mid summer, the average daily temperature is around 19C, but on hot days it may reach 25C, perfect for a dip in the sea (if you dare!). If you prefer to visit Bergen in the autumn, you can marvel at the beautiful colours of the city’s changing leaves. There is a lot to enjoy about Bergen’s weather whatever time of year you visit. Because of the city’s location on the Atlantic coast, it’s not as cold as you might think for somewhere this far north. This table is published by Yr.no, the most used site for weather forecast in Norway. In winter, although the city is usually too mild for snow, you can drive inland and go skiing at Voss or Myrkdalen only 1,5 hours from Bergen. It normally does snow in Bergen some periods during the winter, but it is very unpredictable and might only stay for a short while. Read more about Things to do in Bergen in winter here. The feeling in the city when the first shoots of spring starts to show is really something special. 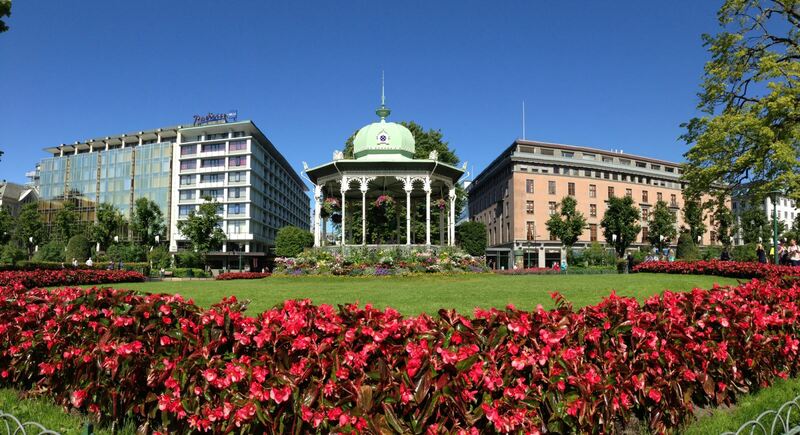 In fact, Bergen is green almost year-round; there are many beautiful parks and public spaces, and the local hills and their endless trees are never far from view. Because of Bergen’s temperate climate, it’s usually wise to pack a waterproof jacket and shoes, or carry an umbrella. In winter, when the temperature is often just a few degrees above freezing, you might like to wear a wool underlayer. Read more about what to wear in Bergen in the winter season here. Even on wet days, it’s still worth going outside — there are many fine waterfalls not far from the city which are all the more impressive after a downpour. And you may get lucky and view some of Bergen’s truly dramatic weather, when sunshine and rain combine to produce beautiful rainbows against moody skies and the impressive 7 mountains surrounding the city. Get top 10 ideas on what to do on a rainy day or get inspired with Top 10 sunny days ideas! If you are planning to see the fjords surrounding Bergen, check out these essential packing tips!